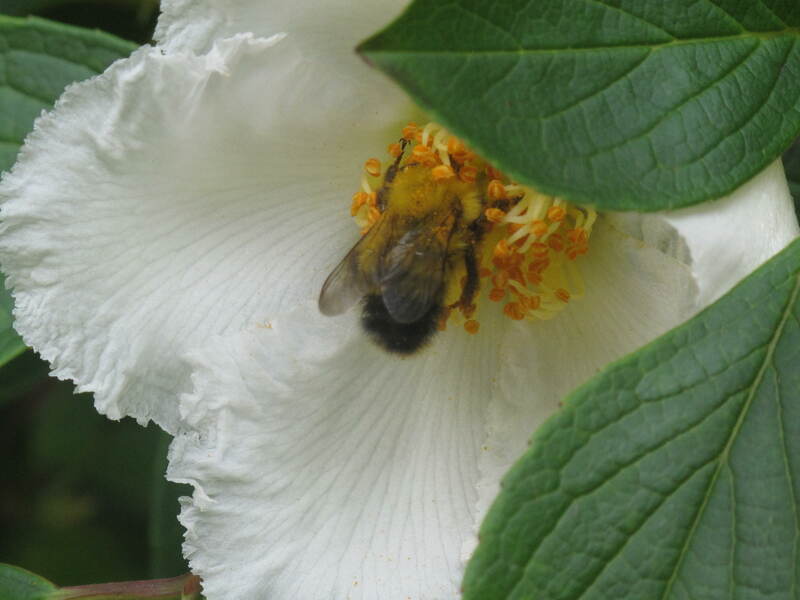 This is a Stewartia bloom with a bee enjoying a little bit of its pollen. If you look close, you can see the bee covered in pollen on its top and even down its wings. Bet he’ll be popular back in the hive. We have often thought about buying some hives and becoming real life bee keepers. Sounds a little dangerous, but fun. Do you or someone you know keep their own bees? This is an old friend. It is our Clematis Bonanza vine which was one of the very first plants that we planted when we moved to Glen Road. That first Spring and Fall seem so far away. One of the reasons we bought the house was the big yard and many gardens that were dispersed around the property. Some gardens were nicely planted and others were vast mud holes. I knew that I could revive my gardening skills put away when I moved out of my childhood home in Iowa at age eighteen and make the gardens plush with vines, plants and flowers. Little did I remember that taking mud to plush meant a lot of blood, sweat and tears. That first year I lost almost as many plantings as ones that grew. Eventually, I realized that to make a dent in the mud, I would need to envision what I wanted in a certain area, research what grew in our area of Connecticut that looked like my vision and then utilize that particular plant in my garden. In other words, just because something was pretty didn’t mean that it was going to survive the hot Summers and freezing Winters that Connecticut has to offer. 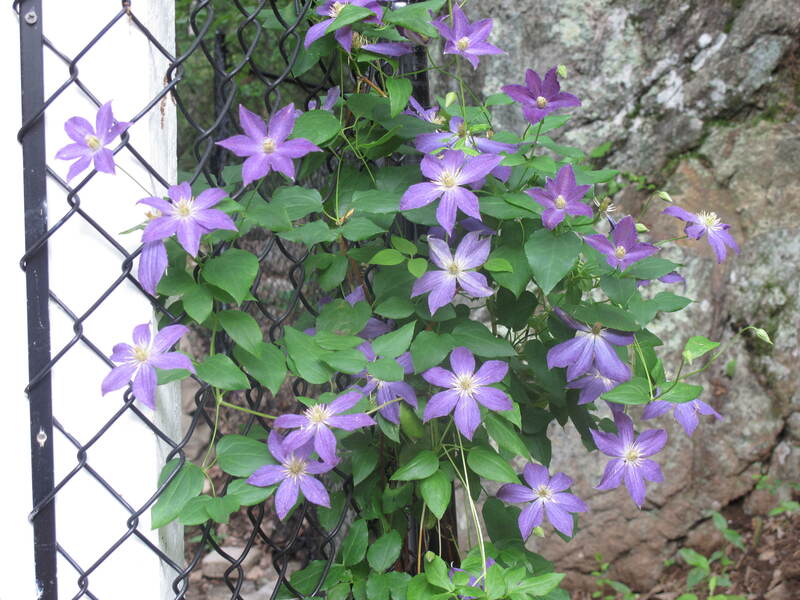 From my studies, I found the Clematis as the perfect flowering vine to cover my backyard fence. It did not prove me wrong and flowered there for the last five years. Then I thought we had destroyed it. As I’ve mentioned in previous posts, we did some construction to our home over the Winter and Spring here on Glen Road in an area that was heavily planted. 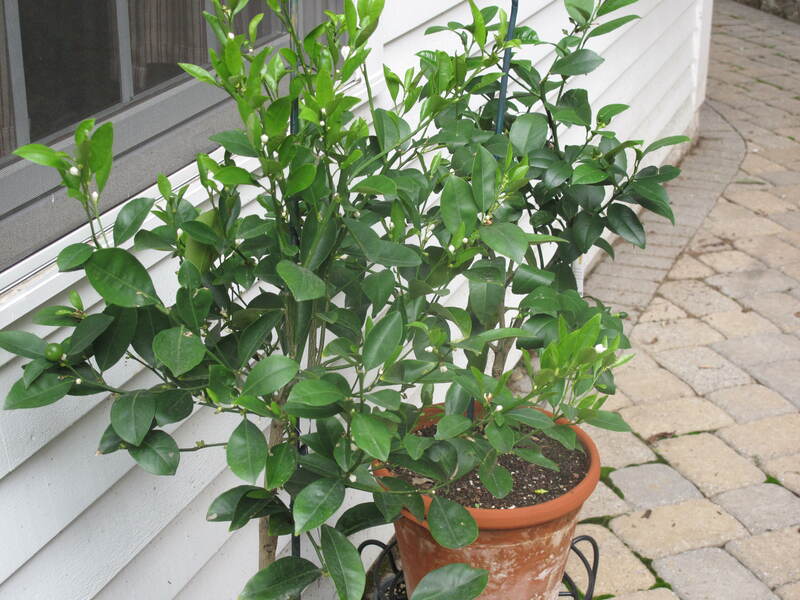 We worked very hard with some landscapers to relocate many plants that we knew we could use after the renovation. However, we were told that the Clematis would most likely not make the move so we just left it where it was. I figured it would be driven over, built upon and then destroyed and we would need to start fresh with new plants. To my surprise this Spring, a large section of it rose from the ground and attached itself to the new fence that we had installed around the backyard, two feet from where the old fence once stood. It did what it had done for the past five years. 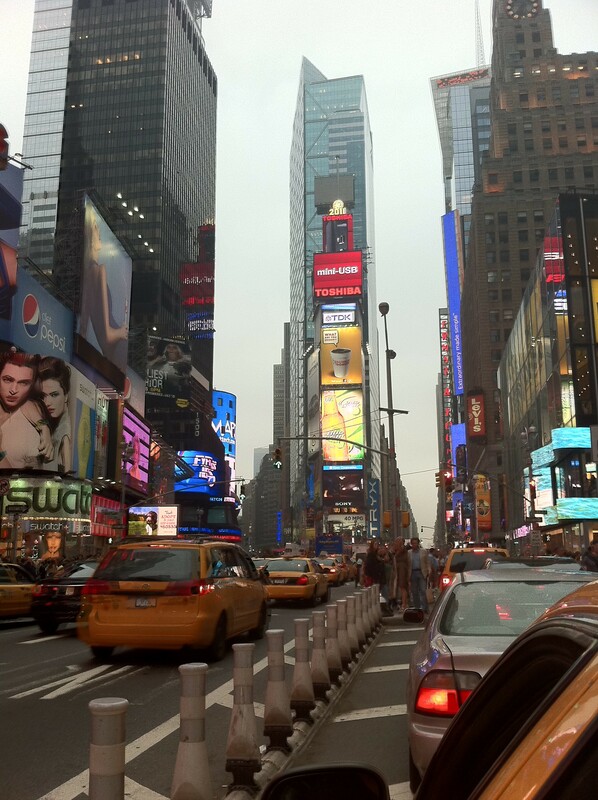 It was amazing given the amount of construction work that went on in the area where it grew and prospered. When I noticed it this Spring, I got a wide smile on my face and laughed. It was if it was saying to me ‘ha ha ha, you can’t kill me off that easy’. I’m so glad that we didn’t. Clematis is a genus of about 300 species within the buttercup family Ranunculaceae. 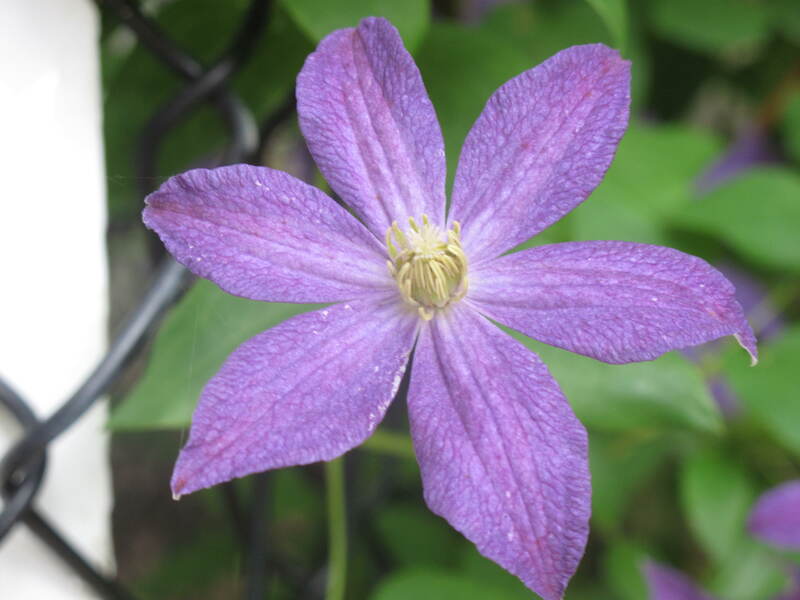 Their garden hybrids have been popular among gardeners beginning with Clematis jackmanii, a garden standby since 1862. 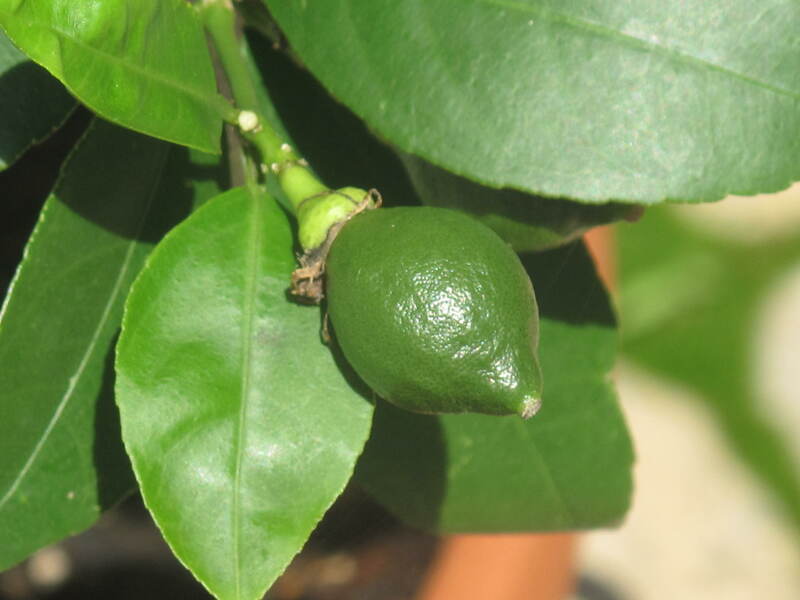 More hybrid cultivars are being produced constantly. They are mainly of Chinese and Japanese origin. 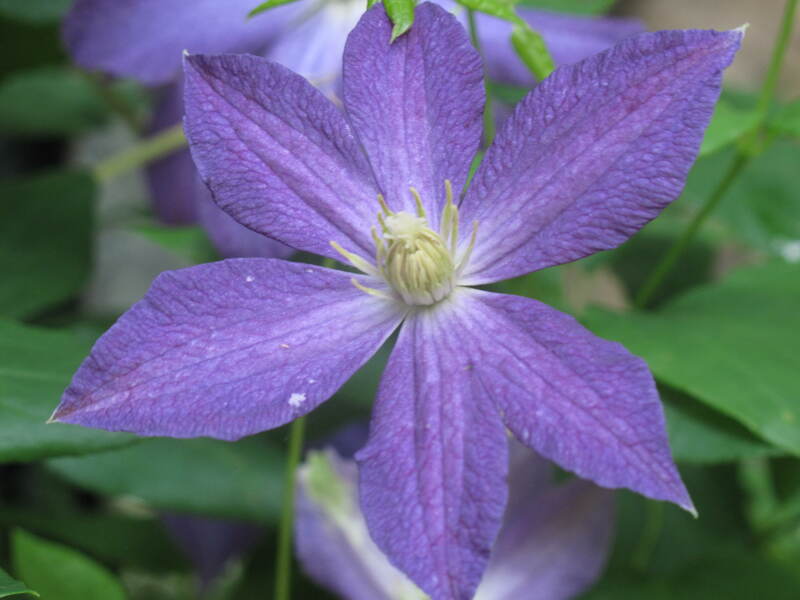 Our Clematis Bonanza was introduced at the Chelsea Flower Show in 2006. This free-flowering Clematis blooms from midsummer into September. We have let Bonanza, with its purple-blue blooms up to 3 inches wide, grow along our backyard fence with much success. It is a hardy and vigorous vine and generally shunned by deer. This is always a good thing for our deer-ravaged part of Connecticut. Our only concern at this point is around the amount of sun the Clematis is receiving each day. Most Clematis prefer the full sun with some shade around its roots. Our new construction shades the Clematis for most of the day. We will need to keep an eye on it to make sure it can survive with only a few hours of direct sunlight. So hats off to you Clematis Bonanza and your ability to survive against even the hardest of times. We are so glad you did. Here’s hoping you have enough sunlight so that we can bring you some new brothers and sisters in the Fall to help you fill in that backyard fence. What are your favorite ‘children’ living in your garden? 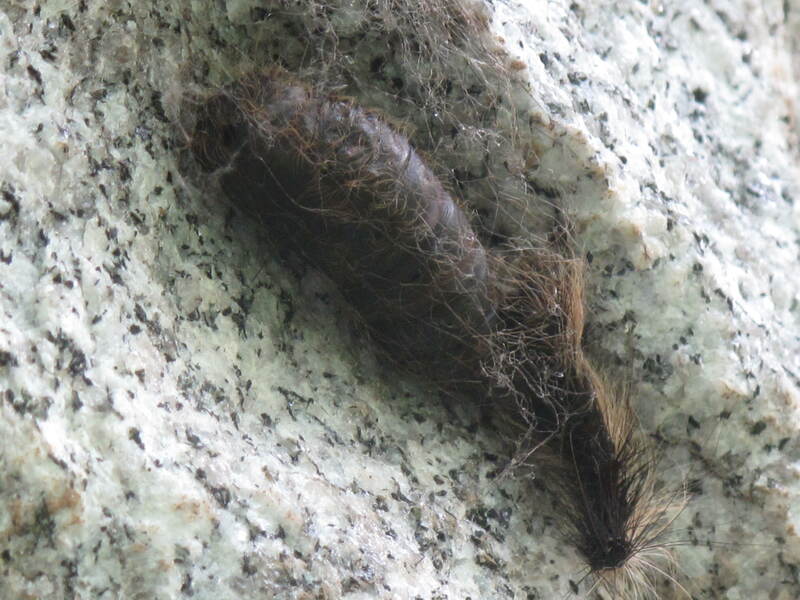 Critter Alert – What Is It? 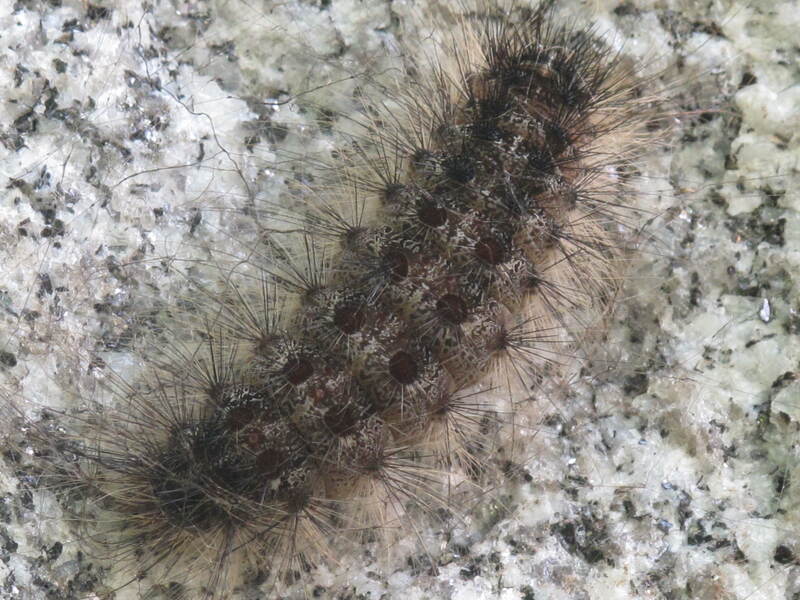 This is what I found on the granite posts that support our espalier apple trees. What the hell is it? 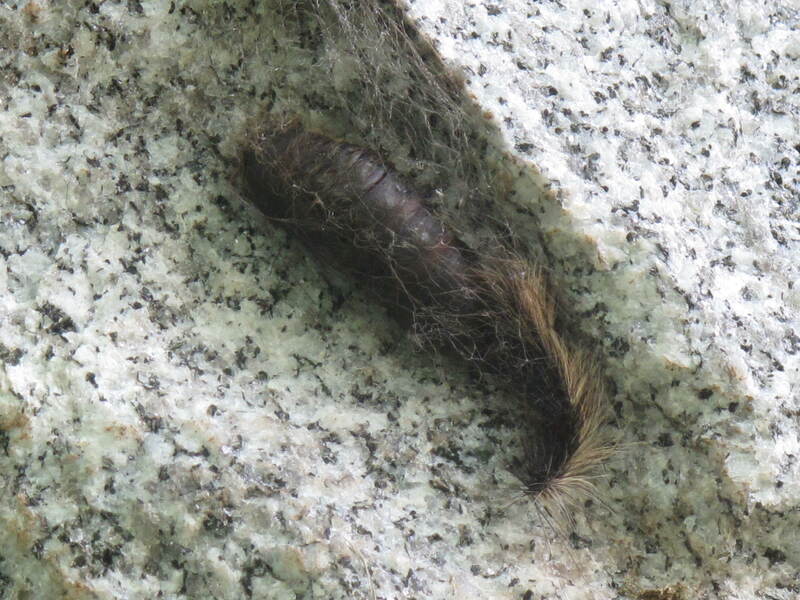 A larvae of some sort with some fur or hair sticking out on the bottom. When I saw this on the post, I almost threw up. Again, what don’t I like? What’s my least favorite part of living in the woods of Connecticut? Yes, the critters. It can be as big as a beaver or as small as a hairy larvae, but the site of something like this from nature sets me free. I don’t really know when my critter fears began. As a kid I was always one with nature. I caught frogs and toads, tried to catch fish with my hands, used to watch the pheasant and quail fly around in the fields behind my house. Something changed and all I know now is that there is no joy…there is just a rush of heat through my body as my natural instincts instruct me to run for safety. It’s the weirdest thing. The larvae has to be related to the caterpillar I found on the other side of the post. As a young kid, I would have grabbed the caterpillar, rubbed its furry little body and maybe put it into a jar with air holes poked into the top to watch it turn into a moth or a butterfly. Now, I attach the telescopic lens to my camera and zoom in from across the yard to get the picture. Here’s what I’m hoping. Maybe the larvae and caterpillar have something to do with the luna moth that was stuck to the side of the house for so many days last month. Maybe the luna gracefully flew to the granite post to leave one more generation of its beautiful family and this is what I found. With my critter luck, I know that this caterpillar probably produced the larvae and out will come some hideous moth with fangs, a large wasp with a six-inch stinger or some strain of garden eating worm. Let’s pray for the luna moth! So rest assured that I will be hitting the internet this afternoon trying to figure out what is stuck to the espalier posts. I may even go to the book store and buy a moth/butterfly book to see if I can figure out what is growing in the back. I pray it is not something hideous so I won’t have to go out there and knock it off the post. That would mean the neighbors would get to see another round of me screaming and running around like a crazy person. If you know what this is, please leave me a comment. In other words…..What is it? This is a transition period in our garden. The spectacular blooming of the more tender plants of Spring is over and the vast majority of the gorgeous blooms are just memories now. 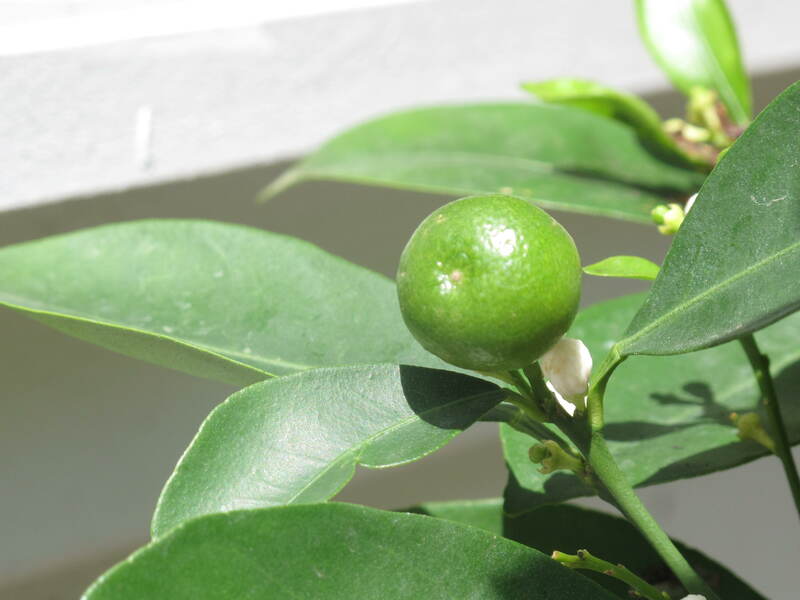 As we start Summer, the new wave of bloomers tend to come from more hardy plants and shrubs that are better able to take the hot temperatures and small amounts of moisture that Summer offers. The plants of Summer are a tough bunch. They can stand up to the brutal 100 degree days and seem to not mind too much if the raindrops are far and few between. You can just tell by looking at them. They actually look tougher than their Spring cousins. Hardier and thicker, their flowers seem to stare at you and say ‘what are you looking at?’ Remember when you were growing up and the ‘tough’ kids would hang out together and taunt other kids by saying thing like ‘come over here and we’ll punch you’ or ‘what’s your problem?’ or ‘what are you looking at?’. That’s these bloomers…the tough kids. They know how to get along with little help from others. They are scrappy. They need to be to make it through July and August. Enjoy our latest virtual garden tour and see what’s blooming on Glen Road. A shot of Hemerocallis ‘Stella de Oro’. The blooms begin in mid-June and then bloom strong through the end of Summer. The first Asiatic lily to bloom. Lillium flowers last a long time before leaving. A spray of blooms from the climbing rose bushes. A maturing lavendar plant will provide some nice scent later in the Summer. 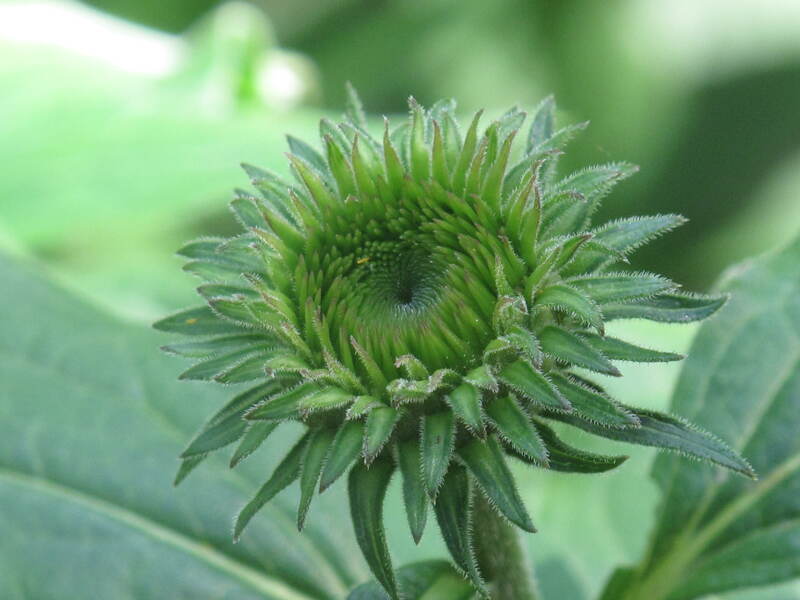 An echinacea bloom almost ready to show its stuff. Hydrangea blooms beginning to mature. Here is a white bloom. A hydrangea bloom tipped in blue. Another hydrangea bloom tipped in purple. The tip of an almost blooming Liatris spicata Kobold. A thick purple stalk of flowers are right around the corner. A forming bud of Monarda Coral Reef. It’s supposed to be deer resistant but Glen Road deer seem to enjoy it. A bloom on Lysimachia clethroides. Spreads like a weed and needs to be contained so as to not take over the garden. When it is all said and done, we’re glad the tough kids are out there growing during the Summer. From now until the end of August, the days get so hot that it makes it difficult to spend a large amount of time working out in the gardens. Some light weeding, deadheading and evening watering is about all you can do without major heat stroke. Even though we stay indoors or by the pool more, it is still a great feeling to look outside and see that you still have flowers blooming. Raises your spirits even in the hottest of times. What are some of your favorite Summer bloomers?